With the economy being as uncertain as it is, everyone’s searching for a way to save money on things they need. This is especially true when it comes to purchasing used power tools. 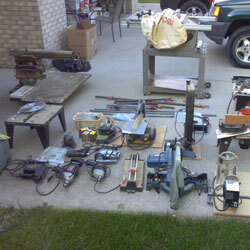 When shopping around at garage sales, thrift stores, or Craigslist, you have to be careful about the tools people sell. Some could be missing parts or be damaged in areas that you might not be able to see. Important: If you find someone selling a batch of newer tools and something just seems off, there’s a good chance the tools were stolen. It’s best to stay away from these types of deals or you may be inadvertently contributing to the tool theft epidemic. If you feel really suspicious, contact the police. With any luck you’ll land a good deal and add a new gently used tool to your collection. Below is a list of suggestions to follow when searching for a secondhand tool without the fear of getting ripped off. This is a very important step when deciding whether or not to purchase a tool that’s been used for any unknown length of time. You want to be sure to check everything about the power cord. If it feels loose, don’t buy it. Loose cords are not only a fire hazard but also can cause shorts that will cause the tool to cut in and out while in use. Be sure to also look at the insulation on the cord. If it looks firmly attached then it’s okay to use. You shouldn’t be able to see any exposed wires. If you can, it’s not safe. Lastly, check to see if all of the original number of prongs are intact. If it’s missing any or if they are bent, don’t buy it. Obviously, if you’re looking at a cordless drill or cordless impact wrench, you want to make sure it includes a battery or the seller has a battery available to test the tool. Most people running a garage sale won’t mind you testing out a power tool to see if it still works correctly and probably have an extension cord nearby for testing. When you inspect it you want to be sure that you look and listen carefully. If the motor appears to be running smoothly then most likely it’s okay. If you smell something odd from the motor or hear any sort of grinding, slipping, or parts rubbing together, those are all signs the tool either needs to be repaired or replaced and you definitely want to pass on it. Testing higher priced tools such as table saws and band saws should ALWAYS be done. One of the other important things that you want to be sure to check carefully is if the tool’s guards or safety features work as they should. Tools that don’t have their safety features working properly are dangerous and not a good investment. As tempting as it may be to get a nice Milwaukee circular saw for $10, you should keep walking if you notice the guard is missing. Another thing to scope out is the tool’s housing. If it looks as if it’s split or badly cracked you don’t want it. If it happens to be missing screws that’s also a bad sign. If the air vent is full of unwanted grim or displays any kind of sign of a burn (or several burns) you definitely don’t want to buy it. The tool could be defective but usually these are signs of improper care or use. The last thing you need is to bring home a fire hazard. It’s always a good idea to do a bit of research before heading out to purchase a tool secondhand. Certain brands have a reputation for being more reliable than others. Less popular brand names can lead to a shorter life expectancy of the tool and may have a habit of breaking more easily with extensive use. Tip: If you have your smartphone on you, a quick search for the model number on Amazon.com will bring up its overall rating based on customer reviews. It’s a good idea to also use this method when shopping for new tools at a brick and mortar store. Spending a few seconds to see if the tool is actually good at what it does can save a whole lot of frustration. The best locations to stumble upon the top brands of durable power tools are actually at garage sales and thrift stores. But you can also find decent deals at flea markets, in online ads such as Craigslist, and even in the classifieds in the newspaper. Keep your eyes peeled at all times when searching for a well cared for previously owned tools to add to your collection. 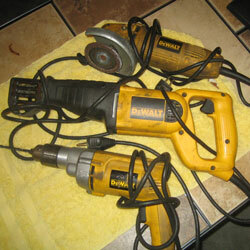 While it’s true that some gently used power tools can be an excellent investment, sometimes they can be fixed up if say in the event you find one that’s missing a power cord. Usually hardware stores carry cords that can be purchased fairly inexpensively. It’s also true that on rare occasions you may happen to land a good deal at a thrift store or garage sale on an older tool that might actually be of better quality than newer models. Just be sure to follow this guideline, use good judgement, and with a little common sense you’re sure to find a good deal. If a mains powered tool is missing the power cord, you’re much better off just passing on it, not buying it with the idea that you’ll add one. This is a different situation than finding one with a damaged power cord. The difference is that many old timers that throw things away that are shorted out, that they deem dangerous to others if someone might scavenge their garbage or wherever the tool ends up, have deliberately cut the cord off so that other people ignorant of the tool’s failed state, won’t be able to plug it into a wall to try to use it. Cords may get damaged by accident but it’s seldom the case that someone would manage to cut the whole cord off then would just throw the tool away because on an otherwise good working tool, to someone mechanically inclined, replacing a power cord only costs $10 and ten minutes time. Thank you for talking about testing the tools you want to buy when they are used. I can see how this can help you find the tools you need and making sure they are in good working order. It makes sense that a good store that sells used items would have the means to help you test the things they offer so the customers would be satisfied with them.